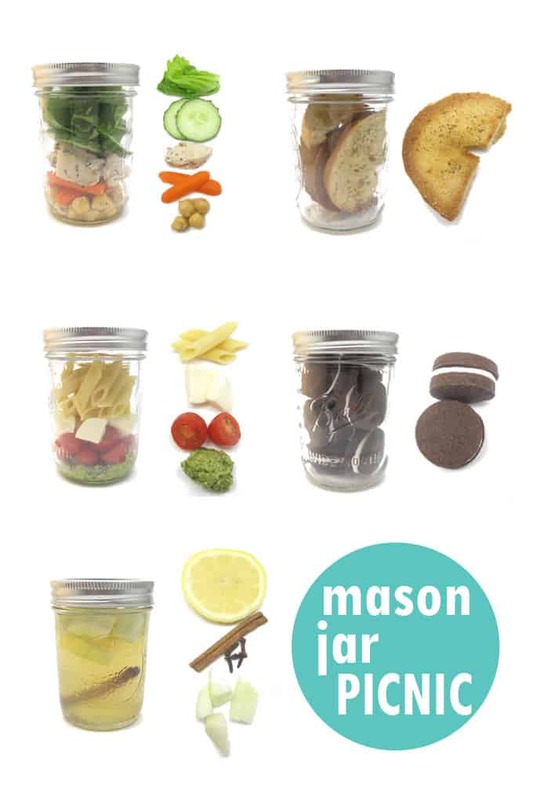 Mason jar meal: A complete meal, all in jars. Perfect picnic idea! How to make a mason jar meal, a fun picnic idea! I love mason jars. 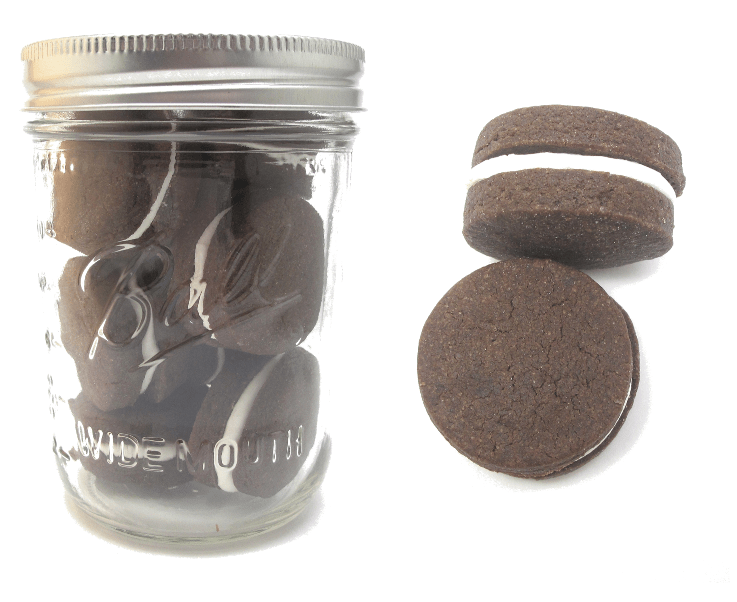 They are perfectly portioned, retro, convenient, and reusable. They are affordable, accessible, versatile and stylish. They contain, shake, serve and store. And they travel. And given that Round 6 of the Project Food Blog challenge is to create a meal that will travel well and still look great, and given that my pizza pops survived Round 5 (THANK YOU for all of your wonderful votes, wonderful people! 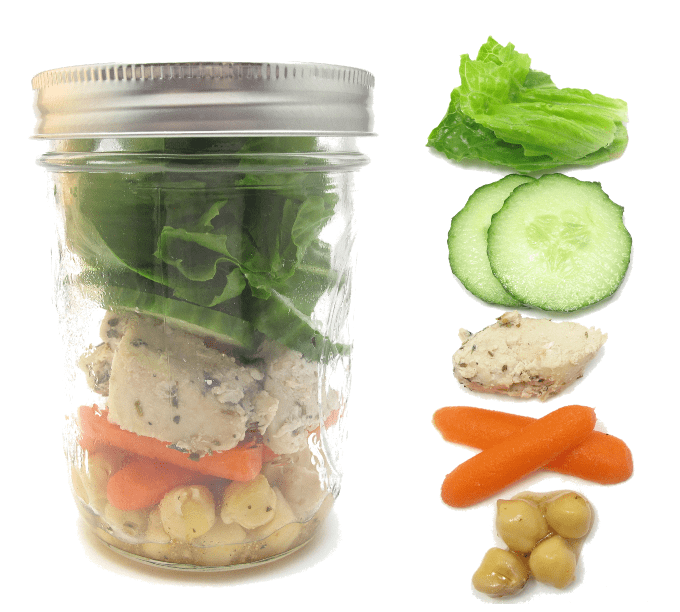 ), I get to do something I’ve wanted to do for ages: create a mason jar meal. My meal for two fit easily in the Project Food Blog cooler we received, with plenty of room to spare. Put dressings and heavy items on the bottom, foods to stay crisp and fresh at the top. For the salad, I mixed the dressing with the chick peas at the bottom to keep them away from the lettuce. Barriers help, like my layer of cucumber slices. For the pasta, I figured the tomatoes would add moisture (for mixing) and acidity (to prevent browning) to the pesto, so I put them together. And I left space at the top of each for shaking and mixing. Rinse and drain a can of chick peas. Place about half in a bowl, add your desired salad dressing (generously, as this will dress the whole salad) and mix. Spoon a layer of the chickpea mixture on the bottom of a mason jar. Top with a layer of sliced baby carrots, a layer of bite-size, cooked, seasoned chicken pieces, a layer of cucumber slices and a layer of lettuce. Shake right before eating. Slice several bagels in half. Slice crosswise in thin slices. Brush both sides of the bagel pieces with olive oil and arrange on a baking tray lined with parchment paper. Sprinkle with kosher salt, pepper, and garlic powder. Bake at 350 degrees for 15 to 20 minutes, turning once. Let cool and place in mason jar. Cook penne pasta and drain, reserving 1/4 cup of the water. Prepare pesto: Process two cloves of garlic, about a cup of fresh basil leaves and 1/4 cup of walnuts in a food processor. With the blade running, pour in about 1/4 cup of olive oil and the pasta water. Add salt and pepper to taste and blend. Add about 1/2 cup of Parmesean cheese. Mix briefly. Blend in more olive oil or hot water to desired consistency. Spoon a layer of pesto on the bottom of a mason jar. Add a layer of halved cherry tomatoes, a layer of cubed mozzarella cheese, and some of the penne pasta. Shake right before eating. 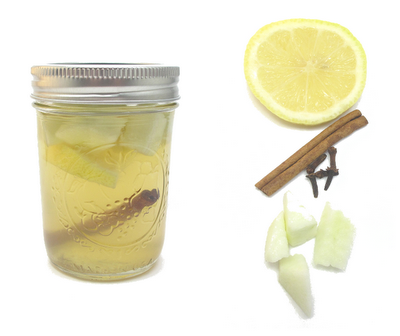 In a saucepan, combine and heat 1/2 cup water, 1/4 cup honey, the zest and juice of a lemon, six whole cloves, and two cinnamon sticks over medium heat to a simmer. Turn heat to low and let simmer for 15 minutes. 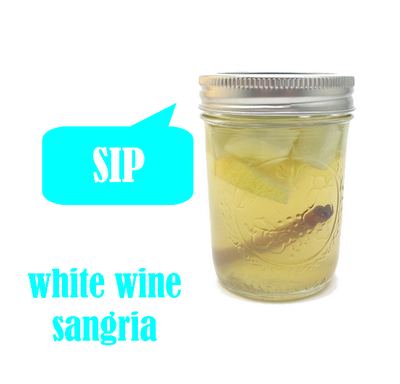 In a pitcher, combine a bottle of white wine, the spice mixture, one apple peeled, cored and cubed and lemon slices. Refrigerate overnight and pour in individual mason jars. Prepare chocolate cookie dough (click the link for recipe). Chill, roll out, cut out 1 1/2 inch circles and bake according to the recipe. Let cool. Prepare frosting (click the link for recipe) and tint white. Prepare a frosting bag with a coupler and size “10” tip. Fill with frosting and close tightly with a rubber band. 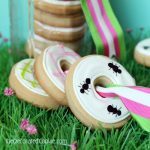 Pipe and fill a circle of frosting on the back of a cookie and top with another cookie. Let dry overnight before packaging in mason jars. The beauty of mason jars is the pretty package. You can add ribbon, labels, and tags. Or attach napkins, plasticware, and straws with ribbon. 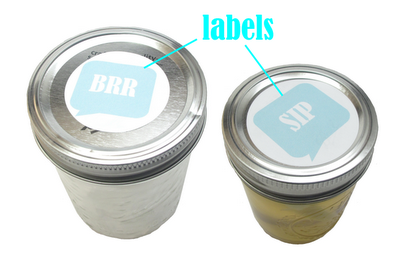 I made labels for the top: “SHAKE” (pasta and salad), “CRUNCH” (chips), “SWEET” (cookies), “SIP” (drink), and “BRR” (ice). To test the freshness, I prepared my mason jar meal in the morning and we dined in the evening. The result? Even better than I expected. Flavorful, fresh, balanced. The layering works well for meals-that-have-to-wait because the veggies at the bottom of the jar marinate in the dressing and sauce, adding flavor, but the food at the top of the jar stays pristine. The pesto stayed green and the lettuce crisp. My pesto could’ve been a bit thinner for better mixing, but that’s my only complaint. 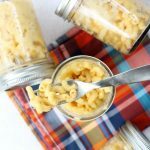 I used the wide-mouth mason jars for the meal, as that made layering the food easier. For the drinks, I used the small mason jars. 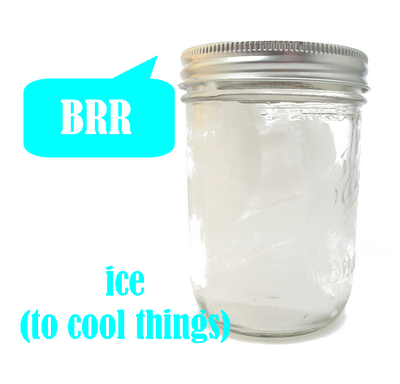 Add a couple extra mason jars filled with ice to your cooler to keep things cool. Mason jar meals would be ideal for outdoor parties and picnics to keep the bugs away. 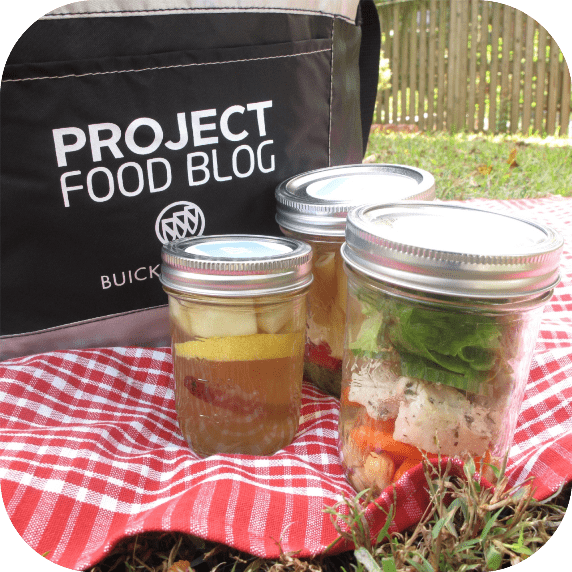 Mason jars add heft and the fear of breakage, so while they are perfect in so many ways, and they are perfect for traveling when heft and the fear of breakage is controlled (such as a nearby picnic, for tailgating, or for traveling in cars). I wouldn’t recommend packing a mason jar meal in your rucksack and climbing a mountain. This is fabulous! Each week your ideas just keep getting better and better! Way to keep plowing through this competition! I'm thinking you have a HUGE chance of winning! Good luck! Fantastic idea- I could see these as the perfect way to do food for a backyard picnic (or even lunches) that don't prep well ahead of time. This is such a great idea to use mason jars! I love you even put pasta in the jars. YUM! 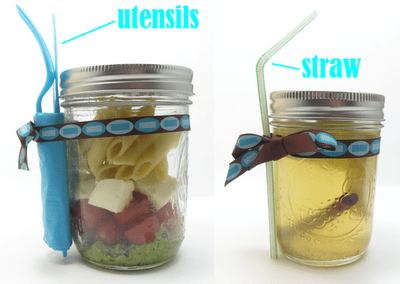 And how cool that you attached the utensils and straws to the jars, very clever. I love what you did with this challange Great job and best of luck! This is such a fun post! Very creative, and effective! 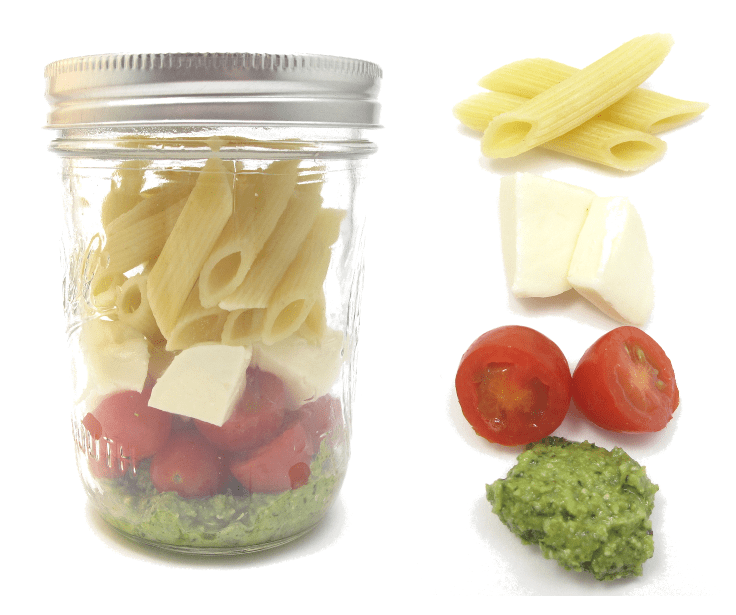 everything you put in that mason jar looks terrific! very creative. . What a fun and novel presentation! Very clever! What a great idea! This is such an inventive and fabulous idea. You definitely have my vote in this round! Beautiful and smart! Now I want go on a picnic. I love mason jars too. My family drinks iced tea from them – it's our little southern tradition. Super, super cute, Meaghan!!! Love the Mason jars! Good luck! 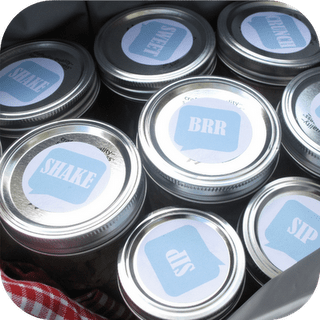 I am going to totally steal your mason jar idea for picnics. Very creative! Kudos! I love the thought that went into it all – from the meal to the layering. Wishing you well with the voting (I'll be there). Wow – so creative! I MUST try these! Can you all please call me every day with such comments? What great cheerers you are! Wow. This is such a fabulous idea. Your ideas are so motivating. I want to have a picnic now too. I am going to have to try out the recipes as well – they all look delicious. It is so great that you continue to advance. Best of luck and cannot wait to see what you come up with for the next challenge. Alriiiiiight, Meaghan! Very glad you're on to Round 6! Love the mason jar meals – the salad and the pesto ones are my favorite – and something I shall try out myself soon – so simple and scrumptious. Thank you! Very cool! I think a fall picnic will be in my near future! Great minds think alike!! I did a mason jar meal too 🙂 I love your photo instructions and labels! Fantastic post. You have my vote. I LOVE this!! That a cute idea! Great job! your entries are always very very cute!!! That is adorable! 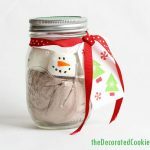 I love the mason jar idea and your instructions on what to do with each are priceless! Very creative! Good luck! LOVE IT!!!!!! I'm so inspired to go on a picnic now! what a great meal! and your choice of container brilliant! You are the BOMB this is awesome!! Love it, love it, love it. This is just the cutest post ever. As a fellow Mason jar-a-holic, I approve! I love the cute labels you added. Great job! I LOVE eating out of mason jar! Something about it is so sweet. I love the pictures and graphics! bravo!! So great! 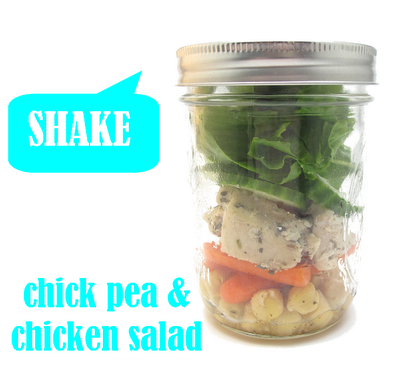 This makes me want to pack a mason jar lunch! I have been looking forward to reading your entries every week! Voted! Wow, I needed that! I'm afraid my days are numbered in this competition with the amazing other entries!! Thank you all!! Meaghan, your creativity amazes me. Do you lay awake at night thinking of these brilliant ideas or what? I am SO impressed!!! Good luck. Hope you win! The most creative meal I've seen yet! This is brilliant, just brilliant. WOW! I love how creative you got here!! GOOD LUCK Meaghan!! What a brilliant way to pack a picnic, and the courses you've put in them are so very special and scrumptious looking. I'm a new reader and am so happy to have discovered your fantastic blog. I love everything you're doing here! I love it and of course voted for you! I love mason jars. I use them in my pantry for everything. This was a very creative idea. I voted for you. I love the way all the jars look fit into the cooler 🙂 This is such a fun idea and I think it's awesome how everything from salads to ice to crackers and sangria can go in a jar! CUTE and informative! 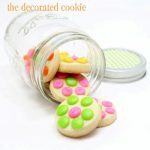 Love the way you showed how to layer the jars! You have a vote from me! I just love this idea and love that you included the recipes. You have my vote! Super clever! What a great way to contain and organize a picnic! What a great idea. Your pictures enhance it so well. I do this for lunch at work everyday using mostly mason jars but occasionally French Le Parfait jars too. I am enamored with this idea!! Where do you suggest buying mason jars? (Looking for an online source.) Thanks! Charlotte, I've never ordered online since they are so plentiful around me, but search for Ball's mason jars and they are everywhere. I even spotted some at overstock.com, which has the best shipping prices and speed. I buy mine at the hardware store. Supermarkets often have them, too. LOVE the idea! Great for summers! England doesn't really have mason jars, more pickle jars really. 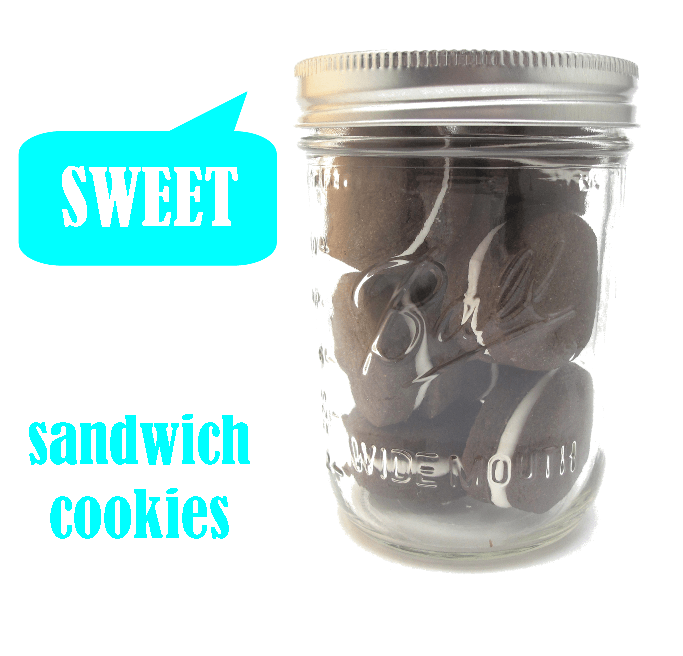 Will definitely be stacking up some cookies into those puppies and going for a picnic! these are amazing!!! great idea. mason jars are great to transport soup and liquids because they won't spill. What an attractive, charming and FUNCTIONAL idea! Thank you! What a great idea! And very creative way to go about it, too! Thanks for sharing! Aw, thank you everyone! Agreed. Aside from the whole heavy-fear-of-breaking-glass thing, mason jars are practically perfect in every way. Sigh. This is very creative! I bet kids would get a kick out of it too! Thanks for the great idea! 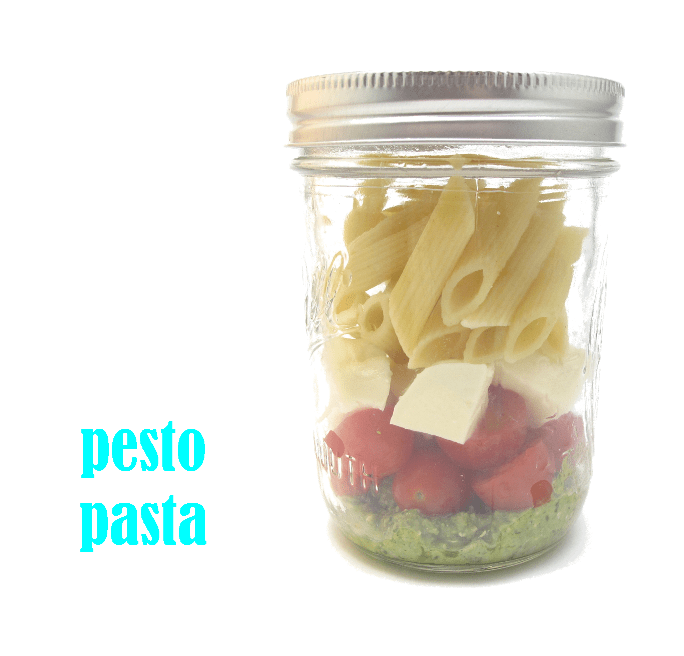 I just thought of putting jello/yogurt (make jello but add one container of yogurt instead of cold water) …repeat: put jello/yogurt on the bottom of jar, about an inch, once it sets add pasta salad with veggies. Once the grandkids eat the pasta, time for dessert….yummy!! These are great. The presentation is *really* cute! SO cute. i am going to plan a picnic specifically so i can do this and make everyone think i am adorable. thank you for sharing!! Love this! What size are these jars? Hi. 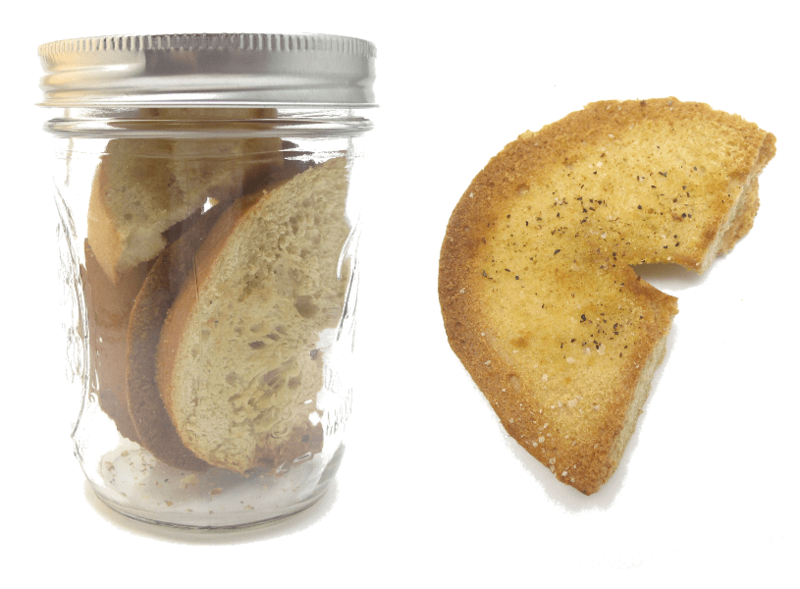 I'm an Italian girl… I'have seen your jar and I love it so much. Can you say where I can buy your perfect jar? I love your ideas and I’ve got zillions of jars (from peanut butter, mayonnaise, pickles & salsa) that I just can’t see putting in the recycle collection. Now they’ve got a purpose just waiting for summer. Thanks! 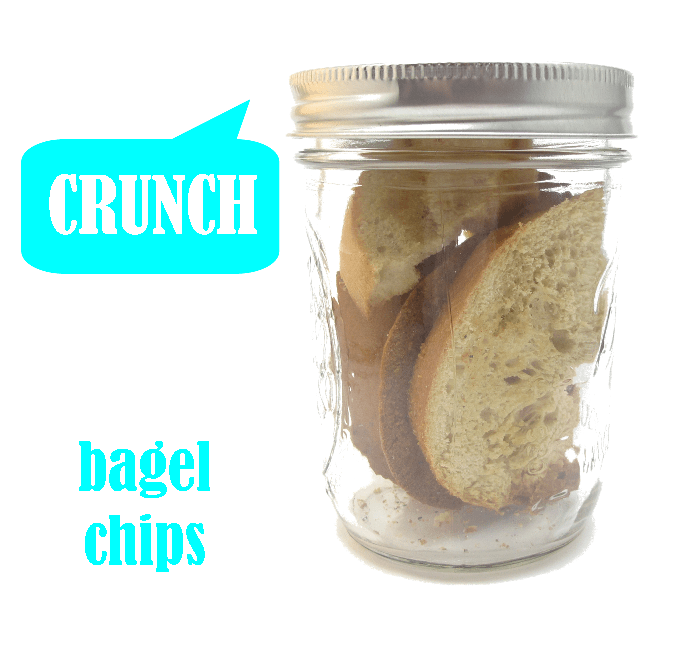 I love your picnic jar idea. I am really fond of mason jars and use them to freeze extra food, like chili and sauces. I can’t wait to take your ideas on my next picnic. Beautiful for picnics. I’m sharing this! Hi Kim… Cold! But gosh, mason jars are microwaveable. I’m thinking of all new recipes now :).